In terms of the morphosyntax, semantics, and pragmatics of its verbal system, Macedonian differs significantly from both Bulgarian and from Bosnian / Croatian / Montenegrin / Serbian (BCMS). Macedonian is closer to Bulgarian than to BCMS both in its preservation of the aorist/imperfect aspectual opposition and in its encoding of speaker attitude in the verb (a phenomenon sometimes labeled evidential). However, Macedonian has developed these and other categories—especially the resultative in ima—differently from Bulgarian, and Macedonian is thus an important and distinct part of the general Slavic and Balkan linguistic picture. 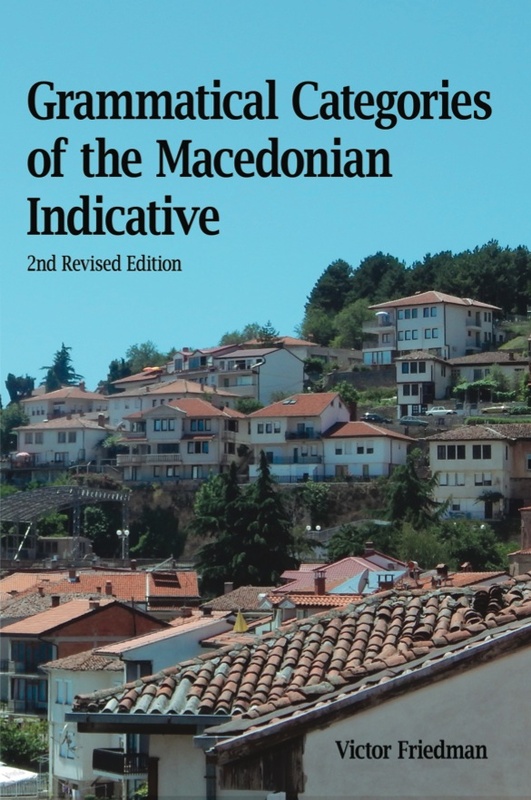 This analysis of the Macedonian indicative system was the first book to be published in the North America about Modern Macedonian, and it was the first mophosyntactic and semantic analysis of Macedonian verbal categories. The framework is Jakobsonian, but with additional generativist analyses inspired by generative semantics. Almost 40 years later, the basic research has proven sound and the frameworks are still useful. This revised edition of the original 1977 book takes into account research published since the first edition and contains an new preface and an expanded bibliography as well as the original appendix of over 300 additional example sentences. The first chapter surveys Macedonian verbal morphology and defines basic terminology. Subsequent chapters each treat a series of paradigmatic sets: the simplex series, the sum series, the ima series, and the pluperfect (beše series). Throughout there are comparisons with Bulgarian, the former Serbo-Croatian, and various relevant Balkan Slavic dialects. The concluding chapter summarizes the preceding four and gives a survey of some of the relevant aspects of various Balkan languages (Albanian, Aromanian, Balkan Judezmo, Greek, Meglenoromanian, Balkan Romani, Romanian, and Turkish) in addition to Balkan Slavic, with special focus on so-called evidentials. The data are primarily from the spoken and written standard language. It documents the usage of the first generation to grow up entirely with a Macedonian-language educational medium. A generation later, it was possible to revisit these speakers as well as their grown children. The data and predictions have stood the test of time, and so are published again in the context of subsequent research. Victor A. Friedman received his Ph.D. in 1975 from both the Slavic Department and the Linguistics Department at the University of Chicago. He taught at the University of North Carolina, Chapel Hill, from 1975 to 1993, when he returned to Chicago. He is currently Andrew W. Mellon Distinguished Service Professor in the Humanities, with appointments in the Department of Linguistics and the Department of Anthropology (associate appointment) at the University of Chicago. He is also Director of the University of Chicago’s Center for East European and Russian/Eurasian Studies, a National Resource Center, as well as president of the U.S. National Committee of the International Association for Southeast European Studies. Friedman is a member of the Macedonian Academy of Arts and Sciences, the Academy of Sciences of Albania, the Academy of Arts and Sciences of Kosova Matica Srpska, and is an external member of the Department of Balkan Ethnology, Ethnographic Institute, Bulgarian Academy of Sciences. He has thrice been awarded the Golden Plaque from Sts. Cyril and Methodius University of Skopje, from which he has also received an honorary doctorate. During the Yugoslav Wars of Succession he worked for the United Nations as a senior policy and political analyst in Macedonia and consulted for other international organizations. In 2009 he received the Annual Award for Outstanding Contributions to Scholarship from the American Association of Teachers of Slavic and East European Languages. In 2014 received the Annual Award for Distinguished Contributions to Slavic, East European, and Eurasian Studies from the Association for Slavic, East European, and Eurasian Studies. He has held Guggenheim, Fulbright-Hays, ACLS, SSRC, IREX, NEH, APS and other fellowships and grants, and he has published extensively on all aspects of Balkan languages and linguistics as well as on Lak, Georgian, and other languages.